"Tragedy", Julia Holter's first album, is loosely inspired by one Euripides' play, and tragedy, "Hippolytus". If she interspersed portions of the original text into her lyrics - they were “positioned by an aural logic rather than in the chronological order”, informs the album booklet*, musically this record follows nothing but itself, and it goes in a variety of directions that defies the imagination. Still, the album contains an introduction, an interlude and a finale, just like in a tragedy, and Julia Holter shows this way and on the outside her undeniable respect for structures, which are also intrinsic to each song, yes song, on this near "mystical revelation" (Piero Scaruffi) of an album. Well, the structures on those songs ain't conventional for sure. But maybe one of the first most striking thing about this record is the variety of styles touched upon, each song being its own dimension and each song exploring several soundscapes, while still succeeding to create incredibly homogeneous songs and a miraculously consistent whole. Without surprises, the album starts with "Introduction", and Julia Holter has decided not to spare her audience to begin with. Indeed from the very first second we are thrown into another world with the help of what could be described as 'fictional field recordings' : there's the feeling of being some place outdoor and being surrounded by bell-chimes and electro-statics, or are they insects, or both, circling our ears, when suddenly a shell blows, while the bells disappear abruptly, then a couple of foghorns something erupt out of the blue, and nearly scared the wit out of me the first time. Them shell and foghorns reappears a little later again, this time I was prepared, until the whole thing collapses into a little 'plop', you know, the one we hear on our own old home recorded tapes. Ah yes, "Tragedy" was indeed recorded at Julia's home. Some seconds of silence and oh! maybe we are back home after all because we hear what seems to me to be a tape, yes, recording of an opera, which rather quickly disintegrates into some unidentified machine loudly purring. It is replaced near instantly by some equally loud strings, probably a cello, and sampled choirs, with what seems at first to be some muted flute or clarinet, which occurs to be a woman's humming voice, most probably our musical host, Julia Holter, until only the voice remains for a little while, but in turn replaced by some noisy electro-metallic pulse, itself simply cut into total silence for about the ten next seconds separating this track from the other "Try to Make Yourself a Work of Art". The A-word is announced and indeed this is Art, it is experimental, it is eyebrows rising or frowning, it is an intriguing and disconcerting collage of unconnected sounds, and it is a bit of a wtf is going on here. Julia Holter is playing with your patience, I mean, I wrote earlier that this album contains songs, right? Well, let's get into this second track and you will see that Julia Holter doesn't try to make herself a work of art, she's not Björk, who is one, Julia Holter is creating Art instead of being a piece of it, she rather looks like your girl-next-door anyway. Now we enter the core of the matter. Or not just yet. Eh, what is this zoo? What kind of animal is that which is trying to imitate an elephant with the throat of a peacock? Some more hard to identify but creepy found sounds surround, something like violins tuning, maybe a saxophone is thrown into the mix (Casey Anderson is credited on this track) and Julia's humming a little further until it reaches some religious singing. Something insidious is going on. At 1:18 mark, Julia robotic chants "Try to Make Yourself a Work of Art like me-- You can't! See? Only me. What your mind, so sound and safe, cannot know. This was my plot. *" accompanied first by what appeared to be finger-picked cello, then a bowed one, giving a simple and rather slow pulsation. Then the unexpected happens, the track explodes into a clattering threnody, while Julia pronounces the words "Only me" : martially stomped heavy percussive instruments, chain-rattling also, with some insisting synth lines or something in the background and we find ourselves surprisingly close to some proto-Industrial bands like Faust or mostly Einstürzende Neubauten, or some electro-acoustic version of it. And in there, despite the threatening and near hostile mechanical environment, where the clouds seem loaded and low above our heads, Julia Holter shows the first sign of her pop influences with some "o-ho" thrown into her vocals, the above lyrics are repeated all along, and the apparent darkness clears up for a moment. Without really being aware of it, the above mentioned synth has turned into a huge invading harmonium, punctuated by some clearer religious-like chants. There is a little something of Nico circa "Desertshore" around and then not, because for the last third of the track, the whole thing vanishes into a black hole wall of tempestuous multi-layers of electronic, and organic, drones amplifying themselves exponentially into near Thomas Köner's dark ambient territories, and this until the next song "The Falling Age". 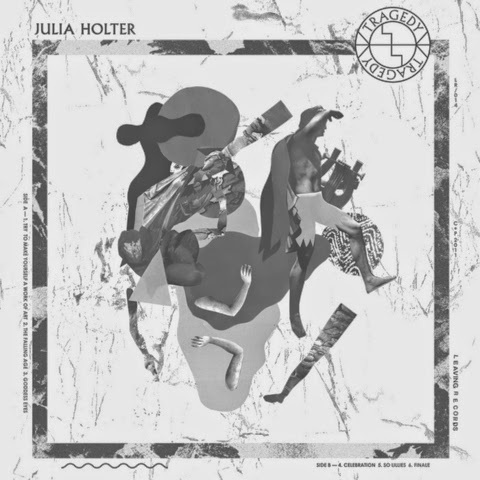 Two tracks into the album and it is clear Julia Holter won't choose for the obvious and the expected. Any song can begin this way, then explore another way, to end up in still another, slipping in and out of melodies, in and out of abstraction. It is a sonic but also musical journey. Julia Holter is foremost a composer before being a sound experimenter, she's also a singer (even though it is still not that apparent until now) and a musician before being a conceptualist, if she's really much of the latter despite the 'concept' behind this album. The concept is somehow just a pretext, an inspiration, it doesn't really matter. What matters is the desire to explore, discover and... play. The sonic storm slowly dissolves into the next song, the nine-minute "The Falling Age", to be steadily supplanted by a simple, but haunting, synthesizer line and Julia's slightly echoed voice becomes more poignant, melancholic, even heart-affecting. Several layers of synth thicken the sound and the whole thing delves alongside Julee Cruise's seminal album "Floating Into the Night" (1989), one obvious reference to Julia's voice and singing tones, Angelo Badalamenti slow-motion low organ-like synths is another here and there throughout all three albums. "Oh what pain! What troubled grief has fallen on this halls and swooped on them from heaven. *" Another snippet from Euripides' "Hyppolytus" finishes the vocal part of the track while the organs increase in volume augmented by some strings ornaments floating on the horizon provided by CalArts New Century Players (Julia studied electronic music at California Institute of the Arts), and down we go like fallen angels into another slower hallucinatory multi-layered and oddly melodic maelstrom made of synth drones, bowed double-bass and purring machinery. It stops without warning to get to maybe the biggest surprise of the album, "Goddess Eyes", which bumps you out of your dreamlike misery with a dry bubbly crackling electronic bass line and Julia shows a different voice through vocoder repeating "I can see you but my eyes are not allowed to cry". Oh well, now we are unquestionably into some of the most singular 80s pop mode where Laurie Anderson's classic "O Superman" meets Enya's unexpectedly huge chart hit "Orinoco Flow", no kidding, Julia accompanying her own vocoder with a quite devoid of effects and catchy vocal melody. There is more going on in this track than in both mentioned older songs referenced above, as piano, synth, beats, multitracked vocals and unidentified sounds wrap the thing up very efficiently, a near singalong song. Should I minute describe each track presented on this album? Maybe not. And you won't believe it but the best is yet to come. The short "Interlude" starts similarly to "Introduction", minus them electrocuted insects, but develops further with the addition of a gigantic church organ melody and more ethereal multi Julia Holter's near liturgical vocals. Some harpsichord arpeggios give this little tune a Renaissance feeling, maybe the only musical detoured reference to Antiquity of the album. And then we enter into what could be described as the major piece of the album, its most radical and at the same time mesmerizing track all around, the ten-minute collage "Celebration", which blends a handful different techniques. Here Julia Holter indulges into her most experimental side, something like a portfolio of her many skills, and runs the gamut from electro-acoustic chamber music to primitive drum-machine beats, from a jazz walking bass to a little girl a capella, from buoyant post-psychedelic balladry to yowling free jazz saxophone, courtesy of Casey Anderson, and from minimalist drones to maximalist field recordings : a compact sonic journey, which carries you from here to there then out there to go further back in a crowded and busy street, outside and inside something like a railway station. It's only when the casual echoed voice of Julia appears saying "check" one minute and a half into the next track "So Lillies" that we realize that we are indeed way into... the next track. "So Lillies" represents another step into Julia's fertile imagination, the more and more cacophonous and rumbled found sounds, full of anarchic incomprehensible chitchats, birds chirping, orchestra rehearsals, more grunting machinery, declamatory street preachers, move into a deconstructed but again surprisingly catchy sorta echoed rap something propelled by a minimalistic techno beat and keyboard pulses. It evolves further like some version of Meredith Monk's profuse vocal experiments, while keeping the beat, until it dissolves into more piano, organs, keys, drones, palaver recordings, silence. The eight-minute "Finale", without surprises the last song on "Tragedy", is the only track which doesn't take unexpected turns and twists throughout its length. The synthesizer introduction lays to me somewhere between some Christmas ditties played by the Salvation Army and the amorphous analog keys sounds created by Robert Wyatt all along his very long career, but the feeling disappears when an earth-shattering organ bass line drops like the casual wings of death and effortlessly crushes the gentle melody to let Julia's juvenile whisper of a voice intoning/singing Phaedra's (one main character of the play this album is inspired by) revelation of "her strange and sudden shameful passion for her stepson Hippolytus" (from the album booklet*) until she commits suicide and the chorus (a real one made of seven real people invited for this track) sings "All leave in silence". Musically, this very atmospheric and surprisingly linear song mixes saxophones, organs and piano into some kind of a dense drones somehow reminiscing Robert Wyatt's masterpiece "Rock Bottom" (1974) and further Meredith Monk's vocal experiments to create a monumental funeral march which could fit one still to be made David Lynch movie, why not a cinematographic adaptation of Euripides' "Hippolytus". This album is baffling from start to finish, and despite the multitude of directions and techniques, the variety of sounds explored, the collection of influences, it remains consistent, unified and magnificently structured, but also exceptionally personal, genuine, idiosyncratic and paradoxically very intuitive. Besides, if the concept behind this record and the experimental flavours could be slightly offputting for some not too adventurous ears - the lines "What your mind, so sound and safe, cannot know. This was my plot. "* could pretty much represents some notice of intent - don't be fooled and be a little patient, several listens, and I mean really several ones, still haven't delivered all the hooks, angles and richness of this thing to me, but in the meantime one will very early on be rewarded with some highly pleasurable moments, which will increase exponentially at each new encounter, I mean, that is what is still happening to your gHost. "Tragedy" could very much be one of the best debut album in the history of music recordings. With a masterpiece like this to begin with, Julia Holter could have disappeared into thin air, this thing would be remembered and admired for years, maybe decades, to come. Fortunately, she's still around, she's still very young, and she delivered two more albums in the meantime, and this is a good thing.